Time really flies this year, it is already almost two months since our brass band performed at the ’50 years City of Reinach‘ Festival. 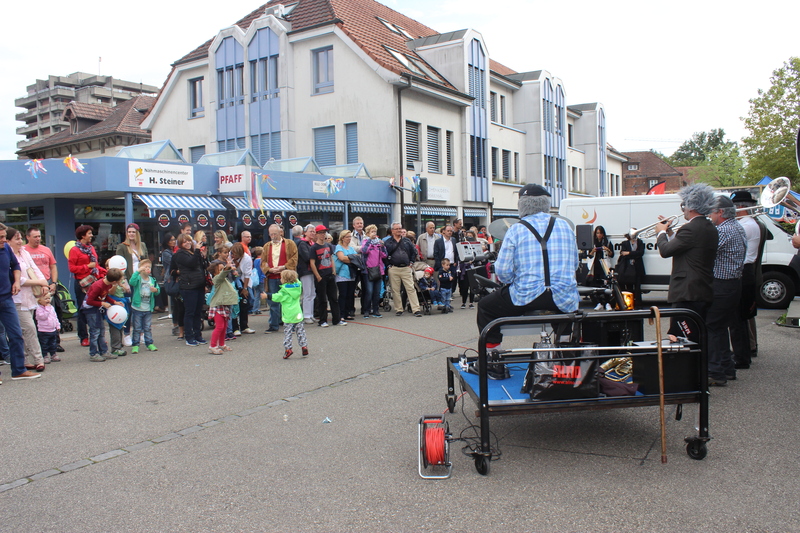 An estimated 60’000 visitors made their way to the Basel suburb of Reinach for the three day event. The 50th anniversary celebrates the day this village was officially named a city, due to the number of inhabitants reaching more than 10’000. Today about 20’000 people call Reinach home and for us it is the place where most of our band members grew up or worked for extended periods of time. In preparation for the Stadtfest Reinach we created a series of short videos which show us reading ourselves for the big festival. Although in Swiss German, we trust that our quick explanation below each video will help you understand the content. Harry owns Reinachs best known sewing machine repair center and the camera finds him in his repair shop in the basement. Upon receiving a call he is reminded that it is time to prepare for the Stadtfest Rynach. With the instrument in hand, all that is missing is his fake moustache and Harry is off to our special training session. Our horn player Christian runs a shop in Muttenz and his staff member finds him asleep in the office. What might he be dreaming about? Of course his beloved boat on Lake Biel and that holidays are so much nicer and better than work. However even in this dream his wife reminds him that he has a special training session ahead of him in preparation for the Reinach City Festival. David and Sven Steiner enjoy their time on the campground and are discussing how to fillet their catch of the day. Jessica behind the camera however reminds them, that they have a special band rehearsal for the Stadtfest to attend. It is clear that the preparation of the fish has to wait until later. While playing with his baby daughter Matilda our trombone player Damian notices a strong smell from the nappy area. Unfortunately though a call reminds him about the extra rehearsal required for the Stadtfest and he has to leave immediately. Olli protects the Swiss border together with his canine partner Faith. This highly specialised dog is still in training, but today the lesson has to stopp early as Olli is needed at the brass band training for the city festival. Our drummer Juan has a chat with his date on top of his cherry picker at work. During the conversation however he gets reminded that he is late for the special brass band rehearsal for the ’50 Johr Stadt Rynach‘ festival.